Home Tags Posts tagged with "MGT-GCC"
❗️Still SHOWERING THE QUEENS OF KING’S ROW❗️The queens are still on high after Saturday’s Community Baby Shower hosted by the MGT&GCC of The Nation of Islam and the 10,000 Fearless Movement. The feedback has been overwhelmingly positive!!! The MGT had several extra items left over so while going door-to-door today at King’s Row Apartments, we gifted more mothers and others who had relatives in need!! For the first couple of days in Torino, Italy we had the freedom to tour the city, shop and experience all the Italian cuisine our hearts desired. I, being the foodie that I am, was looking forward the fresh pastas, authentic Italian pizzas, chocolates, cafes and desserts! It was myself, Sisters Hassanah, Harmoni, Nzinga, Scherri and Summayah. We wasted no time taking advantage of being so close to everything. I don’t think any of us realized how much walking we had to do, so the first stop was H&M to get some flats. Along the way, we took photos and I recorded video footage of the group as we journeyed through the city’s cobble stone streets, which by the way didn’t have any traffic lights or signs. Therefore, we had to be careful walking since the drivers were not as observant as one would hope. Torino Fashion Week- Touring Torino + Milan from Ebony S. Muhammad on Vimeo. That night we took more photos of the city and the unique architecture that surrounded us. Every luxury brand one could imagine was minutes away along with local boutiques. One particular thing I noticed throughout Torino, as far as fashion, was how modest their selections were. It wasn’t just a few stores here and there that carried modest attire. Just about every store we entered had a modest theme. The first night in Torino we dove right in to experience the authentic Italian pizza! I had the veggie pizza, and yes I ate the whole thing (laughs)! There is definitely a difference in how fresh all of the ingredients were, how much toppings were given and the overall taste! It was filling but not overwhelming in portion, which is totally the opposite in America. After dinner we went out for gelato, my second one that day ;-). On the second night, we went to a more formal restaurant and made reservations for everyone in our party. We started off in their downstairs dining area, but we were asked if we wanted to move to a nicer space. They took us to their upstairs dining room that was extremely nice and quiet. I had the eggplant ravioli, which did not leave me disappointed at all! Their pasta is incredibly fresh, and again, the portion was perfect! I also had my first Tiramisu for dessert. Just for the record, they do not add rum to the cake. We thoroughly enjoyed our dining experience there. The service at that restaurant was awesome! We could tell they were intrigued by us by the type of questions they asked along with taking our orders and checking on how everything was at our table. Sidebar: We noticed there weren’t many, if any, Black people in Torino. Sister Nzinga and I met a brother we believed to be homeless who was asking for money, but he was along the outskirts of the city. His demeanor was indicative of not wanting to pass a certain point. The only time I recall seeing Black people in Torino was on our way out of the Egyptian Museum, but they were selling souvenirs. When they saw us they seemed almost shocked. We realized that Black people were either not openly welcomed or just didn’t venture into Torino for whatever reason. There were many times when less than welcoming experiences did occur while we were visiting, but it didn’t take away from our excitement. The third day we were in Torino was actually Sister Hassanah’s birth anniversary. Unbeknownst to her, we were all planning a surprise dinner party. We scouted a few restaurants, bought a blueberry gelato cake and balloons. Once we arrived to the restaurant, myself, Sister Nzinga and Sister Hassanah walked towards the back where Sister Harmoni and Sister Summayah were seated. I noticed they were both acting a bit strange. Almost immediately we all decided to sit outside. Sister Hassanah walked out first, and it was at that moment I saw that Sister Harmoni was hiding the balloons under the table! Talking about a close call (laughs). As a result, we decided to go back inside to dine. Sister Hassanah still had no idea we were surprising her for her birthday, so it appeared to her that we had forgotten. After we ate, we could tell she was ready to leave. It was then that we had the servers bring out her cake and balloons! We all dove into the delicious gelato cake! After leaving the restaurant, we enjoyed the rest of the evening walking around the city. By the way, the sun didn’t begin setting in Torino until 9:30pm. I do have to mention the $1,500 Chanel bag and $750 shoes lined in pearls that I saw before we left the store. Excuse me, this was in Euros so it would actually be $1,770 for the purse and $884.43 in USD for the pair of shoes. Be sure to check out Part 1: The Story Behind the Missing Luggage! “Showering the Queens of Kings Row Apartments” – Community Baby Shower (Houston, TX) from Ebony S. Muhammad on Vimeo. TORINO, Italy—What more could a person ask for than for their life dream to become a reality before the entire world? Opportunities like that don’t come often so when Muslim fashion designer, Carmin Muhammad, was invited to participate in Torino Fashion Week in Italy, she accepted without hesitation. Out of 125 participants, only five were invited from the United States, of which Carmin Muhammad of Al Nisa Designs, was the only Black modest designer. From the moment, the Al Nisa Designs team stepped foot into Torino, Italy everyone wanted to know who they were and about the meaning of their distinct headpiece and garment. Every day numerous individuals and families would approach the group of women to meet them and take photos with them. It was as if the whole city stopped to behold the presence of God in the Muslim Girls Training and General Civilization Class (M.G.T. and G.C.C. ), the women and girls of the Nation of Islam under the teachings of the Honorable Elijah Muhammad and Minister Louis Farrakhan. The Muslim sisters received endless compliments on their attire and beauty throughout their weeklong stay. This year, Torino Fashion Week, June 28-July 3, featured a modest designer segment produced by the Islamic Fashion and Design Council, featuring over two dozen designers from around the world including Carmin Muhammad. 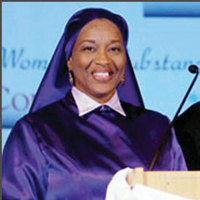 Ms. Muhammad, a long-time and experienced designer extended invitations to a small group of Al Nisa Designs team members to accompany her and share what seemed to be a surreal, yet, long-awaited opportunity to represent the Nation of Islam on a world-wide platform that was specially created to showcase modest fashion. Hassanah Muhammad (Rialto, Calif.), Harmoni Muhammad (Los Angeles), Summayah Muhammad (Rialto, Calif.), Nzinga Muhammad (Rialto, Calif.), this writer Ebony Saffiyah Muhammad (Houston), Scherri Muhammad (Rialto, Calif.), Georgette Muhammad (Rialto, Calif.) and Sonya Muhammad (Calhoun, La.) were among the delighted band of M.G.T. and G.C.C. to take part in the nine day fashion expedition. Along with them was Mikal Muhammad (Los Angeles) who served as the group’s security to ensure the safety of the sisters while in Italy. “It was such a blessing to be in Torino, Italy at the invitation of Sister Carmin Muhammad, to represent the teachings of the Most Honorable Elijah Muhammad,” expressed Georgette Muhammad, a fellow designer and owner of Freedom Apparel. “When we came through as sisters and they (people of Torino) saw us dressed in the garment in the same style, everyone was in awe of us,” explained Scherri Muhammad, who assisted as the traveling manager of the Al Nisa Designs collection. No one could have prepared the group of Muslim women for the reception, support, love and attention that was showered upon them during the whole week in Torino. Even during what was considered “down time” when the group toured the city on foot in their modest Muslim attire and draped scarves, people were drawn to them recognizing that there was something different and special about them. All praises are due to Allah (God)! On multiple occasions, special accommodations were made for them at dinner to be seated in the area of their choice, that was modest and secure. The video footage produced by the writer of this article Ebony S. Muhammad the publisher of Hurt2Healing Magazine, offered a behind the scenes look at all four days Al Nisa Designs took part in Torino Fashion Week. The video presentations displayed the business networking events and workshops that were facilitated. The debut night of Al Nisa Designs was captured as well as reactions from attendees from all over the world. The Torino Fashion Week awards ceremony, where Carmin Muhammad received the Top Three Designer award from Ala Hamdan and the Louis Vuitton honorary brand award was recorded and released online for the world to view. “My goal in filming this entire fashion week was to showcase to the world of what Master Fard Muhammad, the Most Honorable Elijah Muhammad and the Honorable Minister Louis Farrakhan are producing inside the women and girls in the Nation of Islam, and to bring everyone along for the experience,” said Ebony S. Muhammad. “When we were walking around in our uniform, it’s not like when we walk around in America. It’s different. It’s kind of like they know what they’re looking at,” said Nzinga Muhammad, an Al Nisa Designs assistant who captured the fashion show video footage seen in the day 4 video compilation. M. G.T. and G.C.C. proudly modeling modest fashions. Since the inception of the Nation of Islam in the West, the class of women who are called Muslim Girls’ Training and General Civilization Class (M.G.T. and G.C.C. ), have always been known for their way of covering. 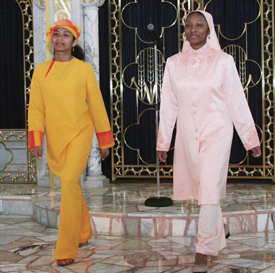 The garment, designed by Master Fard Muhammad and implemented by the Honorable Elijah Muhammad for the women in Islam, is not only a fashion statement unmatched by any other woman in or outside religion, but is a direct declaration of war against the negative ideals of Western and European styles of so-called fashion. From the quality of fabric, stitching, cut, and the obvious modest covering, the women in the Nation of Islam have established their throne of fashion that even women in Christianity marvel at. The magnificent creativity that comes from within the mind of the M.G.T. and G.C.C. can only be described as heavenly, awe-inspiring, regal and of God, Himself. On October 15, 2016, the ultimate declaration of war will be made. The call of the 10, 000 Fearless Women Backing the 10,000 Fearless Men in Islam has been given and on that night approximately 10 Islamic fashion designers will open the gates of righteous coverings for the entire world to witness. This evening, the world will behold the truth of cutting-edge fashion, trends that are timeless in essence, and women who are in love with covering themselves beautifully. The Islamic fashion weekend will cause other so-called fashion weeks to pale in comparison. If one was ever asked to imagine the face and presence of God in the feminine, it would be perfectly captured in this dispensation of time, in the finest of wardrobes. Jr. Vanguard displaying positive examples of fashion for young girls. Organized by Sister Carmin Muhammad, owner of Al-Nisa Designs in Chicago, Illinois and featuring various Islamic designers from all over the country, the city of Atlanta, will be transformed into a Holy City, a Mecca of righteous threads. This Islamic fashion weekend and show will be a statement of divine unity among women in Islam. Woven within the display of modest fashion will be musical performances by hip hop artist and songstress, Akilah Nehanda Muhammad of Houston, Texas. There will be special segments dedicated to Mother Tynnetta Muhammad and Prince. It was confirmed that the First Lady of the Nation Of Islam, Mother Khadijah Farrakhan, will showcase her fashion line, Newell Apparel. This will be a weekend that is sure to go down in history, that will set a new standard in the fashion industry on a universal level. The tide of a New Civilization and a New Woman is upon us! This fashion extravaganza will take place, Saturday, October 15 at 7 p.m. at the Hyatt Regency Atlanta, 265 Peachtree St. N.E. in the International Ballroom North in Atlanta, Georgia. Tickets are available for purchase, but there is limited space. Visit IslamicFashionWeekend.net, for more information and to purchase tickets.